to get the odd "windows manager" MC or what the name is. maybe the power supply or something. I just went back and re-installed plain ol' vanilla stable Debian on my main computer. Yeah,...I know I ranted about having to get ooooodles of those DVDs. I still hate that, mind you. But honestly,...I can't for the life of me find another distro that is quite so "workable" and adaptable, for my needs and wants. I mean,...Squeeze comes on 8 DVDs now,...and Wheezy (I have heard) will come out on ELEVEN!!!! But you have your hands on an almost complete repository when you have them. With that,...you can pretty much mix and match,...and build your own OS the way you want it. It can be a gaming center,..(for the kids or grandkids),...or anything else you may want it to be. I always go "slim-and-trim" with a small desktop environment,...without too many "bells and whistles". Bunches of games and educational stuff for the grandkids. Photo apps for me. Puppy linux does everything else for me,....(it's my "Swiss army knife"). Couldn't do without a Puppy. 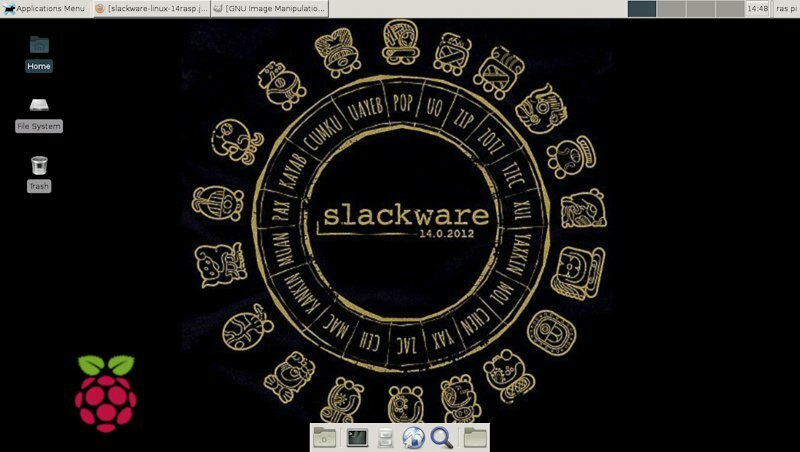 Slackware 14,0 (arm version) running on the Raspberry Pi. I'm surprised how well it runs, Firefox-17.0.1 and all, xfce desktop. Hmm.. could I get this to fit the puppy mould? Who knows? What kind of SD card do you need for that one to work then? How much of the RAM does it need playing a youtube video? That Mayan calendar would look terrific with a Puppy logo in the middle of it,....wouldn't it? I just bought a new hdd and installed Pclinux full monty to the 1st os partition, and have several Puppies on the 2nd data partition. I haven't completely let go if my Vector Classic hdd also with several Puppies on the data partition. I can still boot most any live dist. cd/dvd to check it out. Me neither, Puppy's got pretty much everything you could want in a small space. I'm posting this from PuppEX, a Swedish Slacko-based Pup which I think is very underrated, but I like Carolina as well; it's based on Saluki but has a wider range of apps including Libre Office and Flash works right out of the box. I've just installed Vector 7.0 Light, and so far I'm quite pleased with it. It's got a good range of apps for a smallish distro and Flash works straight out of the box (which is a rarity for a Slack-based distro). I'm going to persevere with Debian this year; I still don't like the fact that it makes it so difficult for you to do any system-based stuff though (I wasn't even able to copy files off a CD-R in one Debian-based distro I tried last year!). Sometimes I've had login problems with Debian-based distros too, and antiX and Swift in particular. However, Solus 1.3 should be out soon and I'm looking forward to that one. That aside, I don't intend to be testing out so many distros in 2013. It takes up too much time to set everything up the way I want it each time, and (I don't know what other people think of this) tbh there are too many duff ones as well these days. I don't know why, but the quality of new Linux releases seems to be getting worse. Maybe there are more things to go wrong in a Linux distro in 2013 compared to, say, 2003, but whatever the reason it's far more common that it should be for a new install to fail (ArchBang last year), the network connection to go down so I have to reactivate it manually every time I log on (as I did even with Scientific, for example), or to not be able to log in (AntiX and Swift), etc. Rant over. Happy New Year everyone and unlike me over Christmas stay clear of the 'flu (at least I'm getting better now). without mounting the local hard disk? can you explain how one do it? Would Puppy automatically mount every HD? I don't think it does what about Knoppix? Cheat code that make to not mount? they don't like my kind of confusing question there . when they did not live up to the RTFM types. I actually got almost ALL of the games my grandson could ever want,...off of the Lenny and Squeeze DVDs. Got them all installed on that tiny 20 Gig hard drive. So when he comes for a visit,...I can now just switch out my 160G hd for the little game-loaded 20G hd. Whoot! That means I really don't ever need to consider spending $$$ for all those Debian DVDs again. My daughter has the high speed internet stuff,....so whenever I'm there, I can quickly download a Puppy onto my flash drive. (Oh, fun, fun!) Now I'm trying out the newest Macpup,...and am really liking it. However, I seem to prefer just using the jwm desktop, instead of E17. And I had forgotten how nice Quirky was (so I'm trying that again, as well). I need to get myself another partition going somewhere on one of my old computers,....to re-install the nice old classic Puppy 431, as well. Posting from Slackware 14.0 (x86) right now. I installed it on my netbook. The netbook's screen is only 1024x600, so I connected a 15" LCD Dell monitor I had and it displays 1024x768 and I disabled the netbook's screen, so running with it's lid closed. I have connected to it a USB Keyboard & Mouse I had. Running XFCE. Then I had my 8GB USB Drive (from Christmas) and a 16GB MicroSD chip (for my tablet) plugged in. I've compiled 2 packages (through SlackBuilds.org) and put them on a USB drive. EDIT: the netbook has a SD Card reader so I used a MicroSD to SD adapter. By default Knoppix will look/scan the HDs to see if it contains partitions. If the HDs do have partitions, Knoppix will automatically build a '/etc/fstab' file and fill-in the appropriate partition entries and will also create the '/mnt/hdxx' mount points. The 'nofstab' cheat code prevents this look/scan and prevents the generation of the /etc/fstab and its mount points. Much appreciated that sounds what is needed indeed. won't nofstab leave it in a state where you cannot do anything with the drives? They are not just unmounted - they are unavailable to mount at a later time should you desire until you go through the process manually. I don't know - I am asking. Oops that is a very important question. to that guy that asked me in another forum. I told him to join the Knoppix forum. i trust them would know? I will not join there only to get riduculed by one of the angry Mods. that asked about iso booting of Knoppix. I had to use setxkbmap se to get swedish keyboard. the ARCHwiki suggest another thing which did not work. To get firefox one use the sfs that have FF and Flash built in.